Hello there! I do hope you are all well, I’m all sore from a gig last night. Not a poetry one sadly but a solo guitar and shoutin’ style gig. It’s been a busy old week rehearsing for that one so I’ve been more or less taking a break from the soul searching poetry nonsense. As I sort of hinted at in my last post regarding my Youtube channel, I did a special session last Friday where I filmed the remaining 7 poems that weren’t up so you can now view my full repertoire such as it is. It was a fun session and I really got into it as I haven’t really had much physical practice. It’s mostly all been going on in my head. A bottle of wine was consumed in the process helping me relax and fueling me to read all my remainder (I had only intended on reading my brand new one ‘Huff’). 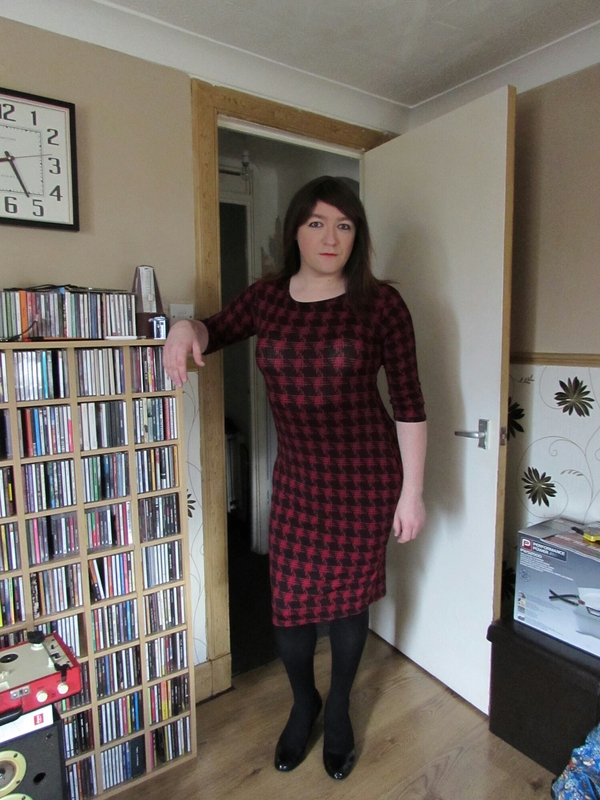 Next time I’ll probably wear a different wig! Not sure when that will be but I hope to arrange something before the summer. There are loads of spoken word nights in Glasgow so I’m also thinking of infiltrating one of them but the matter of where to change would present a minor problem 🙂 In the meantime I’m just going to hunker down and expand the secret poem book as best I can. One of the other things I did was join Instagram last weekend. I’ve met some colourful characters on that I can tell you! I really had no idea that you could send messages over it and so far they are the most irritating aspect. I’ve had to do a whole lot of blocking and declining I can tell you. I can be found under annasecretpoet – what else I guess? I must fly now as it is nearly lunchtime and a mighty hunger has descended upon us! This entry was posted in Confessions, Cross-dressing, Crossdressing, Live Performance, Poetry, Transvestite and tagged anna secret poet, Clothing, confessions, cross-dressing, crossacting, crossdress, crossdresser, Dress, en femme, gender swap, male to female transformation, poetry, sissy, tgirl, transvestite, tv, Wig on February 20, 2016 by Anna Secret Poet. After my last post I feel I was able to describe my newest idea more adequately to people and set about pitching it to various people. Not just people who I know could make it happen on a venue level but friends as well. Hearteningly nobody has said ‘don’t do it!’ yet. A couple of days ago I bought a flowery notebook to house the poetry. I have been trying to visualise various small details like that other than just how I shall look. That has also fired my imagination! Character is very important and so I’ve decided she’s a kooky and neurotic librarian with delusions of grandeur. That’s not to say I’ll deliberately let her read awful poetry. 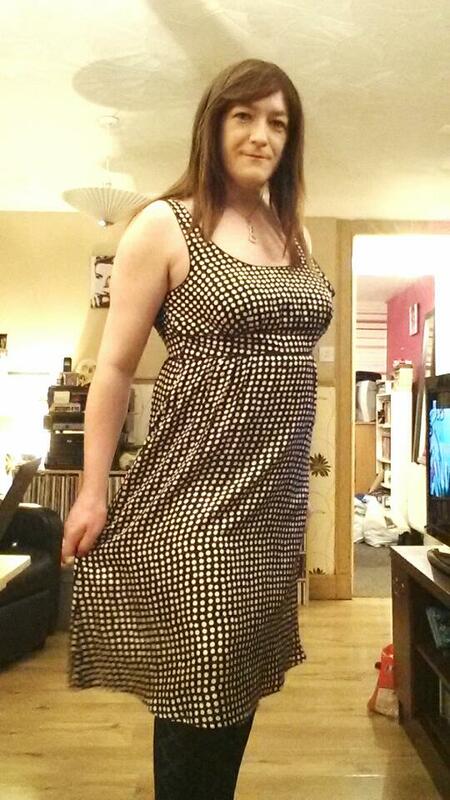 On Tuesday I had a ‘fitting’ for my outfit and tried on 4 of my recent dresses though in truth I don’t think there’s a contest. 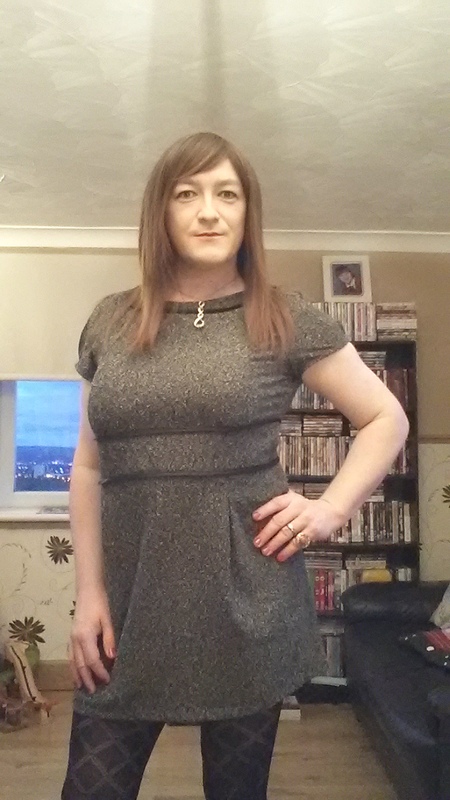 The winning dress is a grey one I bought for a couple of pounds out of British Heart Foundation. This one is originally from George. I may team it with glasses as in this next pic but I’m not certain. What do you reckon – too stern? Although you can’t see I’m also wearing my new red point toed pumps. I’ve decided they should be the only colour in the ensemble. 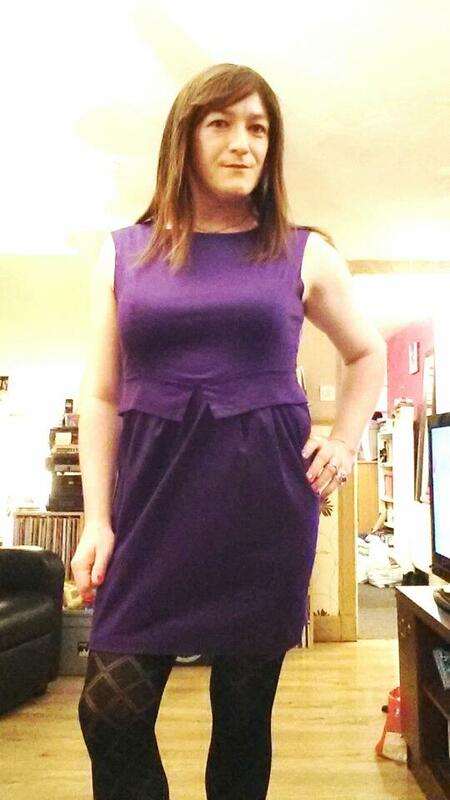 The other dresses I got included a fetching purple one which is probably more night out than librarian but I like it anyway. 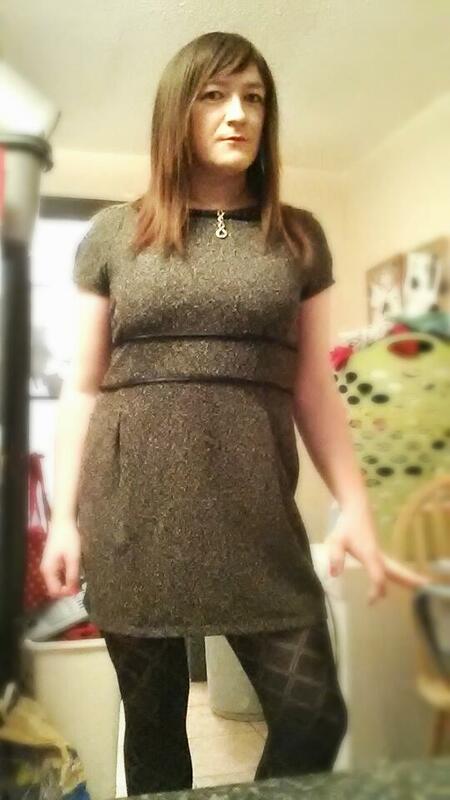 It is from Dorothy Perkins originally. 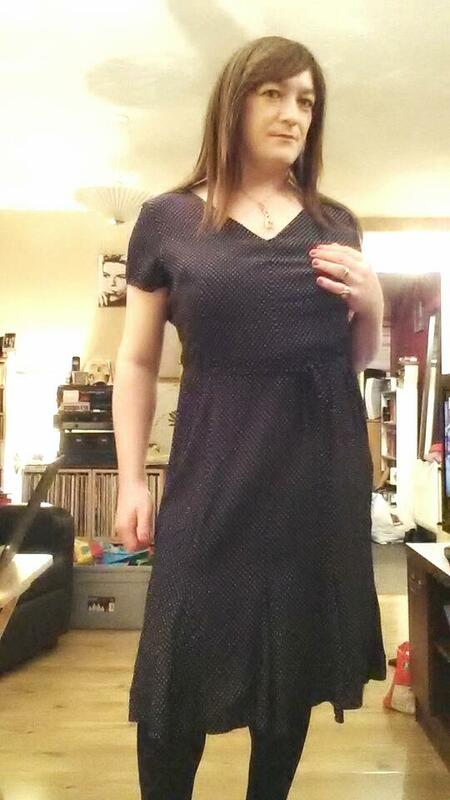 This other one is lovely but made me a bit sad when it didn’t zip all the way up. I really like it though so am going to look into getting it taken out. A first for me. It’s from Marks & Spencers (good god of course that’s not where I got it) and other than the dots it’s principal selling point was the original price tag still being on it. It read: £49.50. I got it for a fiver so I was delighted. 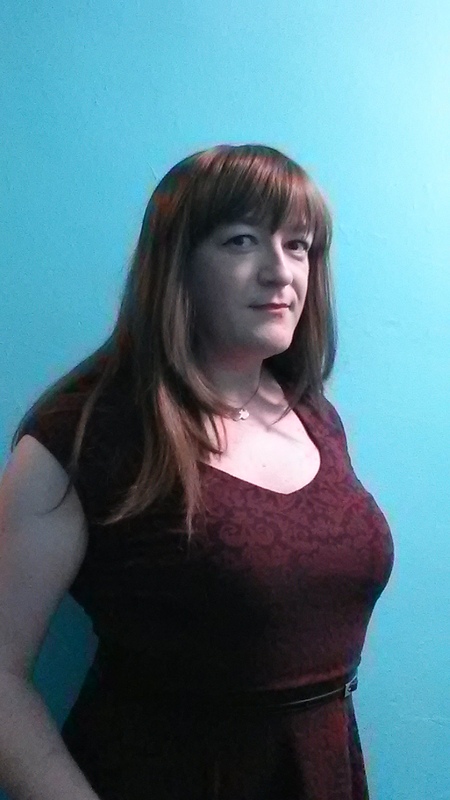 With the outfit more or less sorted I can now think seriously about content. I have already been pondering possible banter and gags to compliment the poetic content. I’m no comedian sadly but I do want there to be humour. Not of the acerbic kind but daft and occasionally surreal humour. By far my favourite kind. 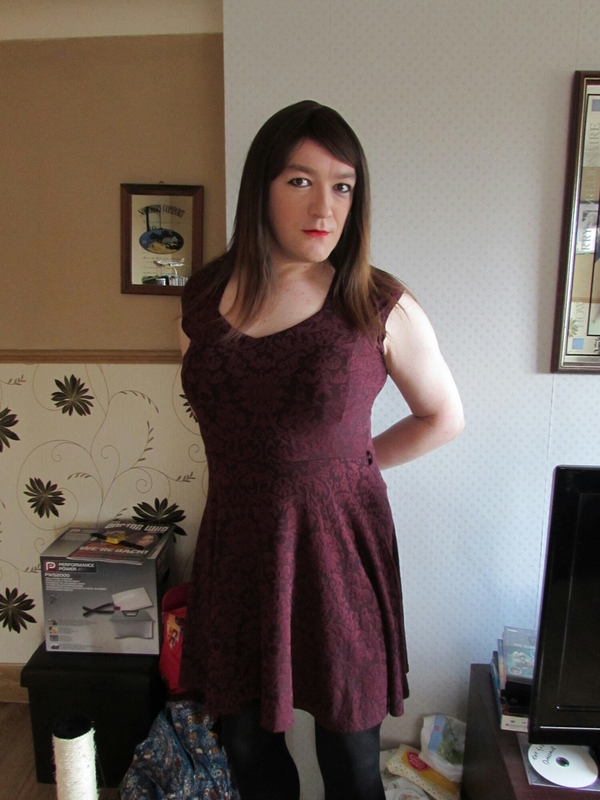 I truly cannot wait to get a date sorted which hopefully is a good sign. Maybe that could give me something to write about…or perhaps I may just share another poem. It’s possible I may end up with a few spare in the coming weeks. 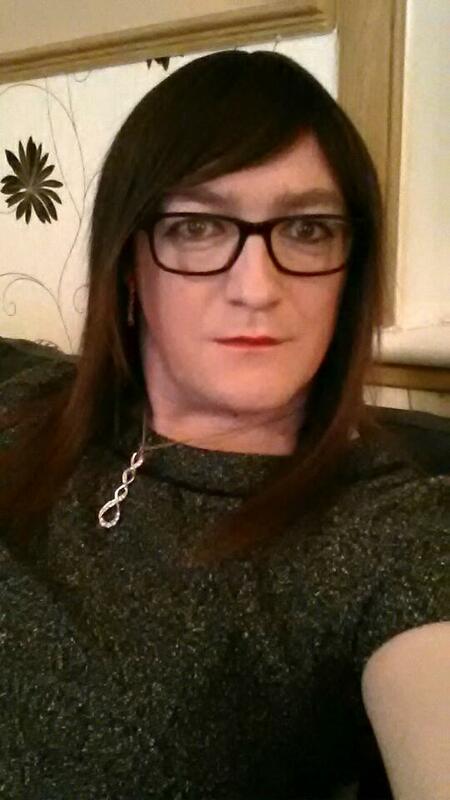 This entry was posted in Confessions, Cross-dressing, Crossdressing, Live Performance, Transvestite and tagged anna secret poet, cross-dressing, crossacting, crossdress, dresses, male to female transformation, outfits, red heels, sissy, tgirl, transvestite on January 14, 2016 by Anna Secret Poet.